A77 and A65 cameras from Sony with 24.3 megapixels and world's fatest 12 fps AF-enabled continuous shooting. 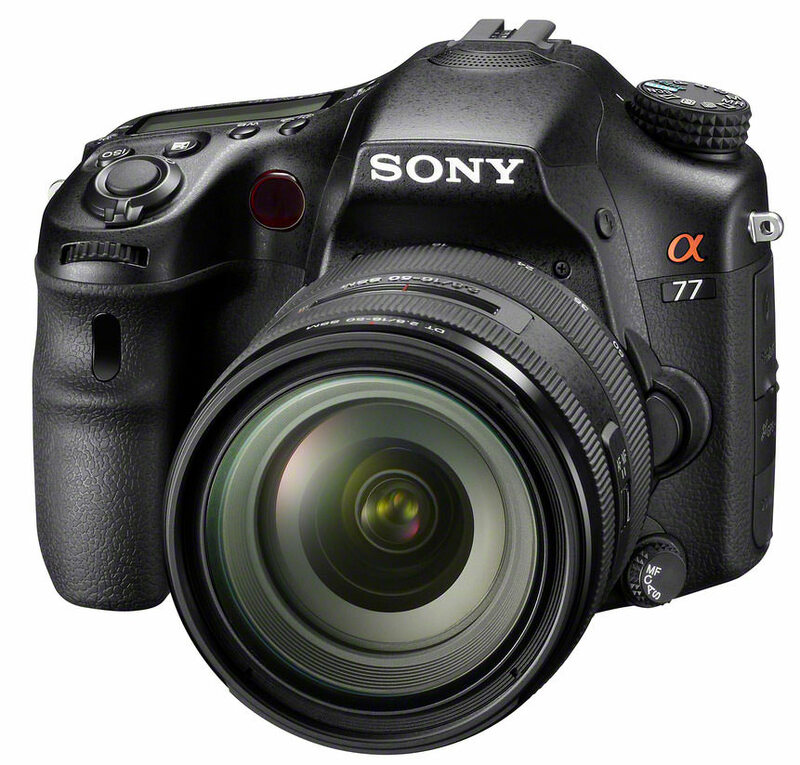 Sony has announced the release of two new cameras, the SLT-A77 and the SLT-A65. These cameras boast 24.3 megapixels and the world's fastest 12 FPS AF enabled continuous shooting. Part of its pioneering translucent mirror range, these cameras are aimed at advanced amateurs and serious photo enthusiasts. Both cameras feature a brand new Exmor APS HD CMOS sensor with an amazing 24.3 megapixels. They also feature a massive ISO range, from 100 - 16,000. These cameras also have the world's first XGE OLED Tru-Finder electronic view finder. This showcases the world's finest viewfinder image, with an amazing 2359k dot (XGA) resolution. Both also feature quick HD movie modes, supported at 50p, another breakthrough for consumer oriented APS-C cameras. Do you have a question about the new camera? Sony's photography expert Paul Genge will be holding a live Q&A session at 7.30pm tonight on Facebook. Paul will be able to answer any questions you have about the new α77, α65, NEX-7, and NEX-5N cameras which launched today. You can join the chat here: Sony UK. 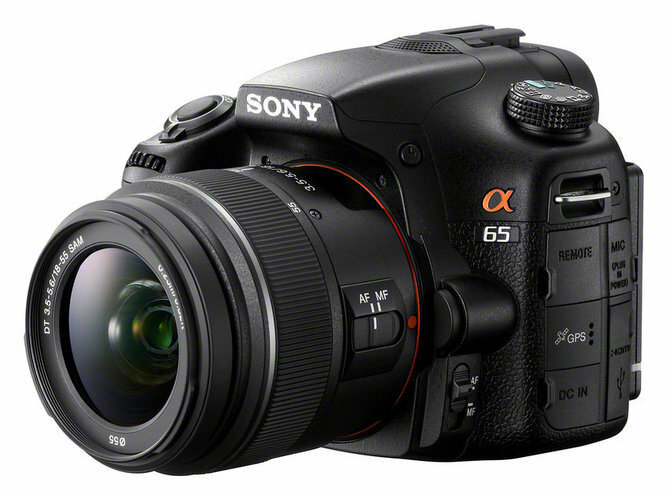 The Sony A77 with 16-50mm lens has an RRP of £1600 and A65 with 18-55mm lens has an RRP of £850. Box Contents Battery charger, rechargeable battery pack, USB cable, CD-ROM, shoulder strap, standard zoom lens. 94 page printed manual. OK - The A77 just shot to the very top of my shopping list! Hmmm, I reserve judgement on that. What I want to know, & no review for any of Sony's SLTs has touched it yet, is how you're supposed to clean the sensor with a mirror in the way. Also, can the mirror be replaced if it gets scratched, or are you spending more time in PS cloning that out as well as the dust spots? And what about manual focus on the LCD viewfinder? I had a Fujifilm S6500, & when you turned the focus ring in manual mode, the centre shot up to a greatly magnified view, then down again immediately you stopped. Very disorienting, & not terribly useful. I love my Sony SLR, but I remain sceptical of this whole fixed mirror thing. Hmmm, I reserve judgement on that. What I want to know, & no review for any of Sony's SLTs has touched it yet, is how you're supposed to clean the sensor with a mirror in the way. Also, can the mirror be replaced if it gets scratched, or are you spending more time in PS cloning that out as well as the dust spots? And what about manual focus on the LCD viewfinder? I had a Fujifilm S6500, & when you turned the focus ring in manual mode, the centre shot up to a greatly magnified view, then down again immediately you stopped. Very disorienting, & not terribly useful. I love my Sony SLR, but I remain sceptical of this whole fixed mirror thing. more interesting to me as a nikon d300 user is, what magic nikon can perform on this sensor. The mirror can be flipped up. There is a small catch at the bottom of the camera, press it, the mirror pops up allowing you to clean the sensor. Then the mirror can be lowered when you've finished. (You can see it in the updated A65 product pics). [quote]The mirror can be flipped up. There is a small catch at the bottom of the camera, press it, the mirror pops up allowing you to clean the sensor. [/quote] Surely they could have done better than that !! Like, selecting "Cleaning Mode" flips the mirror up automatically And surely Park Cameras have made a mistake, got the A77 body listed at £559 !! Quote:The mirror can be flipped up. There is a small catch at the bottom of the camera, press it, the mirror pops up allowing you to clean the sensor. Surely they could have done better than that !! And surely Park Cameras have made a mistake, got the A77 body listed at £559 !! A77 ?....yummy, want !....the first 3 50p coins have gone into my piggy-bank....only 3197 more to go !!!!!!! Yep - I think the barclaycard may be in for a bit of a spanking, come October! Quote:And surely Park Cameras have made a mistake, got the A77 body listed at £559 !! I hope to have a A77 soon, With my 300MM, it should do the bis. My A850 may gather dust? Looks like I may have to update my kingfisher book. I hope to have a A77 soon, With my 300MM, it should do the bis. My A850 may gather dust? Looks like I may have to update my kingfisher book. The A77 does sound very good 'on paper', but why oh why oh why are we STILL waiting for a market leading Professional model? Time to give Nikon and Canon a run for their money? Anyone good any reliable news on this? I note that UK prices have been announced £1149.99 for the body. [quote]Http://www.quesabesde.com/noticias/Sony-A77,1_7902 Some sample images from the A77[/quote] Many thanks for this link.The pictures with the 300MM lens are very good. With object tracking and 15fps I'm hoping to get good inflight kingfisher pictures. most of my pictures are taken with the 300MM 2.8. When I added my A850. I stopped using my A700. I think when the A77 arrives I will still use the A850. I expect to have the A77 quite soon and will be happy to show the results. Many thanks for this link.The pictures with the 300MM lens are very good. With object tracking and 15fps I'm hoping to get good inflight kingfisher pictures. most of my pictures are taken with the 300MM 2.8. When I added my A850. I stopped using my A700. I think when the A77 arrives I will still use the A850. I expect to have the A77 quite soon and will be happy to show the results. I've put up my first A77 pic today. Getting used to the camera, will try to post a pic every day. mainly kingfishers. Put my A850 FF in the cupboard. will try to post a pic every day. mainly kingfishers. Put my A850 FF in the cupboard.